Some estimates have up to 90% of the population of Rome were slaves or slave origin in 1st & 2nd centuries, and 30% of the whole empire! Slavery was very much a part of the social fibre. Slaves technically had no civil rights, yet by New Testament times slaves were permitted to ‘marry’ (although their children remained the property of their owners), and many slaves were paid, which enabled them to eventually buy their own freedom and even sometimes enter into business partnerships with their former masters. Slaves were named by their masters (‘Onesimus’ means ‘useful’ and was a common slave name); many freed slaves changed their names to noble names to escape the stigma of slavery. A number of names mentioned in the New Testament are such ‘upper class’ names, probably because a fair number of Christians were former slaves, possibly given their freedom because their owners had also become Christians. It was not uncommon for someone to enter voluntarily into slavery as a means of paying off a debt they owed, and on these occasions it was a contractual agreement based on a certain amount of money or a certain time of servitude. There were both slaves and maters in the Christian community. Nowhere in the New Testament are masters called to release all their slaves, nor for slaves to try to escape; instead Christian masters are called to treat their slaves with kindness and fairness, and slaves to respect and obey their masters; and (where applicable) they were to relate to one another as brothers and sisters in Christ. In most cases, it would have been unloving for a master to release a slave who had no other means of living. Neither are Christians called in the New Testament to lobby or demonstrate for the abolition of slavery in the empire. In fact the idea of lobbying and protesting for social or political change is virtually absent from the Bible. Not only were the majority of Christians in no place to have any social or political influence, living in an empire where the government was never to be questioned; but they also understood that their mission was not to reform the political and social structures of this world, but to proclaim Christ in light of the breaking in of the Kingdom of God, which will mean the eventual downfall of the kingdoms of this world. So Christians were called to honour and pray for the government (yes, the same government that had crucified their Lord and Saviour, and who were hostile to Christians and the Gospel, with an Emperor who had proclaimed Himself to be Lord and God! ), and to entrust themselves to their faithful Creator while doing good. They were to have confidence in their sovereign God who through history has been behind the rise and fall and fortunes of nations and empires, engineering history to come to just the right moment for the entry of the Son into this history. If the Nations were in the Father’s hand to that point, they could trust that He was still at work in the nations from that point onwards. Slavery was never fully abolished in the Roman empire, however from the first century onwards it did begin to decline, and the civil rights of slaves improved. It’s clearly no coincidence that this change in society was happening at the same time that a revolutionary, grassroots movement was growing explosively throughout the empire – the spread of Christianity. Paul’s words in Philemon are a testimony to the transforming power of the Gospel. In verse 11, Paul uses a play on words: Onesimus means ‘useful’ or ‘profitable’ – yet he was obviously lazy or disobedient or just plain absent, and so ‘useless’ to Philemon. Maybe he had fled after being disciplined by his master – and Roman law placed no restrictions on how harsh the discipline of slaves could be. But he Gospel had done such a work in him that he was now obviously a changed man – not so much in ability as in attitude. The Gospel takes a heart that is self centred and rebellious, and transforms it to one that is willing to serve others, as well as to have a confidence in God’s provision and Fatherhood that enables us to accept our position in life and not attempt to control our own destiny. Why do you do what you do – in your study and career? Because the world has told you that you will only be a ‘useful’ person if you get a degree and a establish yourself in a career that will contribute to the advancement of society? Or, do you desire to be useful more for the Kingdom of God than for the kingdoms of this world? Your real usefulness is not in your skills, but in your identity in Christ, and how that flows into a life lived for Jesus. Onesimus’ and Philemon’s relationship has changed: from Master and ‘useless’ slave, to beloved brothers. This is no trivial thing. Paul highlights the radical nature of this change by using two contrasting words for timeframes: ‘he was separated from you for a little while’ – literally, ‘an hour’ or ‘a moment’; ‘that you might have him back forever’ – literally, ‘eternally!’ And this verse is a parallel to the first part of verse 16: ‘no longer as a slave, but better than a slave, as a beloved brother.’ ‘Slave’ corresponds to ‘little while’ and ‘beloved brother’ to ‘forever’. With Onesemus’ coming to faith in Christ, something has happened that is so radical and permanent that things can never be the same again. Onesimus has, in the words of Colossians 1:13, been ‘delivered from the domain of darkness and transferred to the kingdom of his beloved Son, in whom we have redemption, the forgiveness of sins.’ Remember, the letter to the Colossians was written at the same times as Philemon, and delivered to the same people. 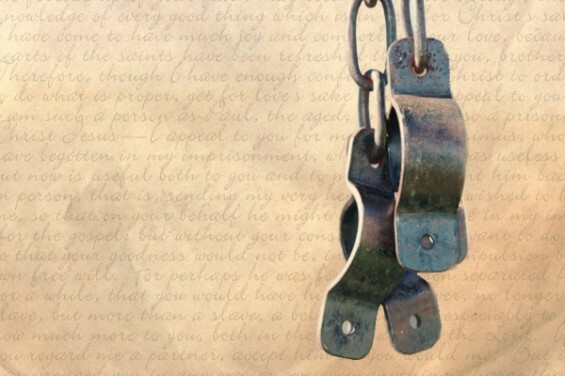 And so it is no mere coincidence here that Paul, in describing the nature of the kingdom of Jesus uses a word taken straight out of the vocabulary of the slave market: ‘redemption.’ This was a word used to describe the transaction made when a slave, or someone on behalf of a slave, purchased their freedom by paying off fully the debt they owed. We were once all slaves to sin, death and fear. We had no rights and no citizenship in the Kingdom of God, because we all voluntarily entered into a contract of slavery by rebelling against God and incurring a debt so huge that were would never ever be able to repay it. Yet we have tried – thinking that somehow our own goodness would be enough to pay it off, or else trivialising our sin in order to make the debt seem less serious than it is. We have all squandered our master’s assets, and fled from Him, trying to hid from him and the wrath we deserve in the great metropolis of human pride, ambition and sophistication. Into this disaster that is humanity alienated from God, steps Jesus the Son of the Father. While He is free from sin, he willingly enters into our weaknesses and failures – indicated by his baptism where he takes the place of repentant sinners – and experiences in himself all the outworking of our sinfulness – both in his life on earth and in his going to the cross where he not only faced the full, just, and complete wrath of God in our place, but also where he paid in full the price that we could not pay – the price of our freedom: our Ransom. But that is not the end. We are not just freed slaves, sent off to try to make a life for ourselves. The Father has adopted us into His family. He has filled us with the Spirit who enables us to cry out, “Abba, Father!” He has guaranteed a place for us alongside His own beloved begotten Son, and we now share in His inheritance! If you are reading this and are not in a place of trusting in Jesus, then you are still in slavery; still captive in the the dominion of darkness. No amount of self effort or denial will contribute one iota to rescue you or solve your dilemma. Your only hope is in Jesus – the only one who is able and willing to reach into your dark place and rescue you by paying your debt and making you a member of the Father’s family. I urge you to put your trust in Him. In verse 17 Paul tells Philemon to accept Onesimus as he would Paul, ie. as a partner – an equal and a coworker in the Gospel. History is filled with failed experiments at human harmony. Whether it’s race or ethnicity, religion, education, or social status. We have a delusion that we will one day grow out of our prejudices and learn to get along with each other. Hostility and resentment, cannot be ‘grown out of’ – it can only be broken by the power of grace – a grace so great that it is able to forgive us of our own enormous debt and reconcile us to God. A Christian who refuses to be reconciled to others is a walking contradiction – as reconciliation is at the heart of our faith. A Christian living in the grace of God that enables us to lay down our lives for our brothers and sisters, for our friends, and even for our enemies, is a walking display of the glory of God. It is through us – His church – that this transforming Gospel power will spread to our communities, so that we will not just see this world become a better place (that is really a pathetic, weak and second rate option), but people rescued from darkness, and lives transformed eternally, to the glory of God. I pray that you may know this overwhelming, transforming grace.